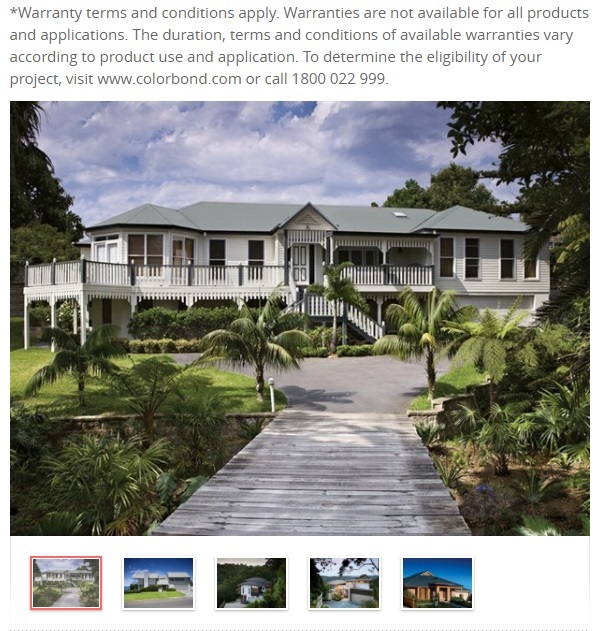 ​Congratulations, you’ve decided to go with Colorbond steel for your roof - it’s a great decision. Now comes the fun part; choosing the right colour. Colorbond comes in an amazing array of colour choices but sometimes having so many choices can actually make the final decision that much harder. 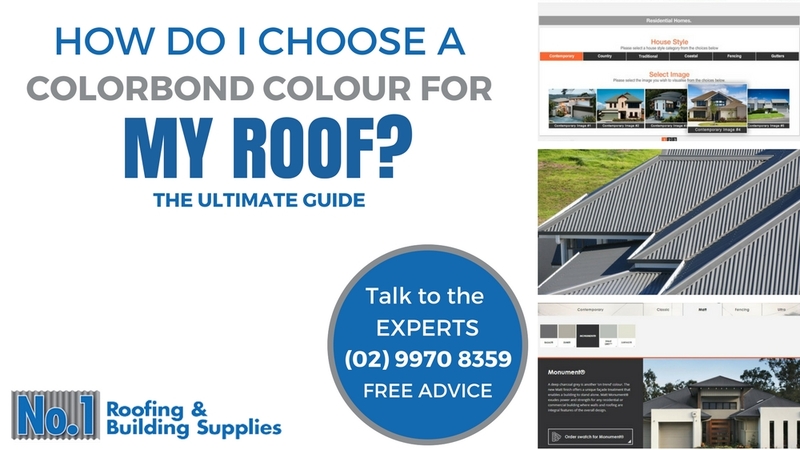 Fortunately, there are some aspects of good design and some great online tools that can help you clarify your thoughts, narrow down the choices, and pinpoint the exact colour you need for a really great-looking roof. 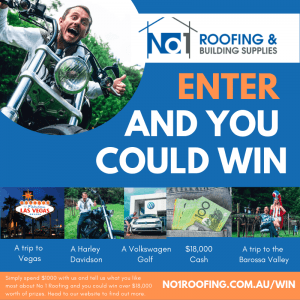 No.1 Roofing and Building Supplies is one of the largest suppliers of Colorbond roofing materials and accessories in the Sydney area. This ultimate guide to choosing your Colorbond colours is just an extension of our outstanding expert advice and consultation service. There are so many Colorbond colours - where do I start? What style of home do you have? Is the house modern or heritage? Is it really a beach style or more traditional or perhaps more a typical farm house? 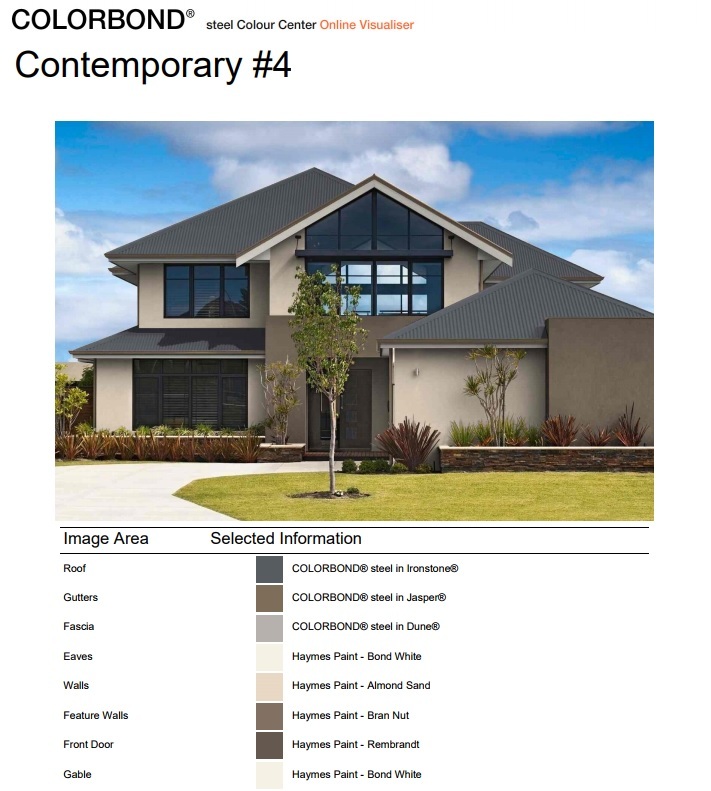 Colorbond very helpfully divide their colour range into clear categories: contemporary or classic. So, colours such as ‘cottage green’ or ‘classic cream’ will be perfect for your traditional older style home whereas colours such as ‘Surfmist’, ‘Windspray’ or ‘Shale Grey’ will bring out the coastal connection in a beach home. It’s really important to find a colour that connects your roof to the rest of the house. This isn’t going to be such a problem if you are painting the entire house as well but if your house has a brick exterior or you are not planning to paint the house your roof colour choice can be critical to the success of the overall effect. Rob Schneider suggests that identifying hints of tone colours in the bricks can then be matched to roof colours to create a strong link. Janne Petrie from The Colour Designers takes this idea even further with the suggestion that you repeat the roof colour in as many as three other areas of the property such as a fence or shed. Matching the roof colour with other parts of the property in this way creates a truly unified look that is easy on the eye. How does the style of roof affect my Colorbond colour choice? It’s also important to consider the style, size and prominence of your roof. Obviously, a steep gabled roof will feature more prominently than a modernist monopitch or a skillion roof. And of course the reverse is true that darker colours can help reduce the apparent roof size where you want your roof to blend in more. If you live near the coastline, you can choose colours like teal, azure, white, turquoise and sandy colours that reflect the colour of the ocean and the sand. If you live in a city, you might want to consider muted colours like black, silver and white. You can use these colours as a backdrop and use other colours to accent. If you live in the country where the prevalent colours are green, blue and yellow, choose a colour that belongs to these palettes. Some housing developments especially near sensitive ecological areas may have strict colour scheme requirements to ensure that your home blends in and if you don’t want your neighbours and the authorities to see red you need to stick with those. Does Council have a say in my Colorbond colour choice? Well yes, they may do. Councils are tending to relax the rules a little more than formerly but if you live in a heritage house it would pay to check before you do your own thing. Even if you're not living in a heritage house it's a good idea to check with the local councils. 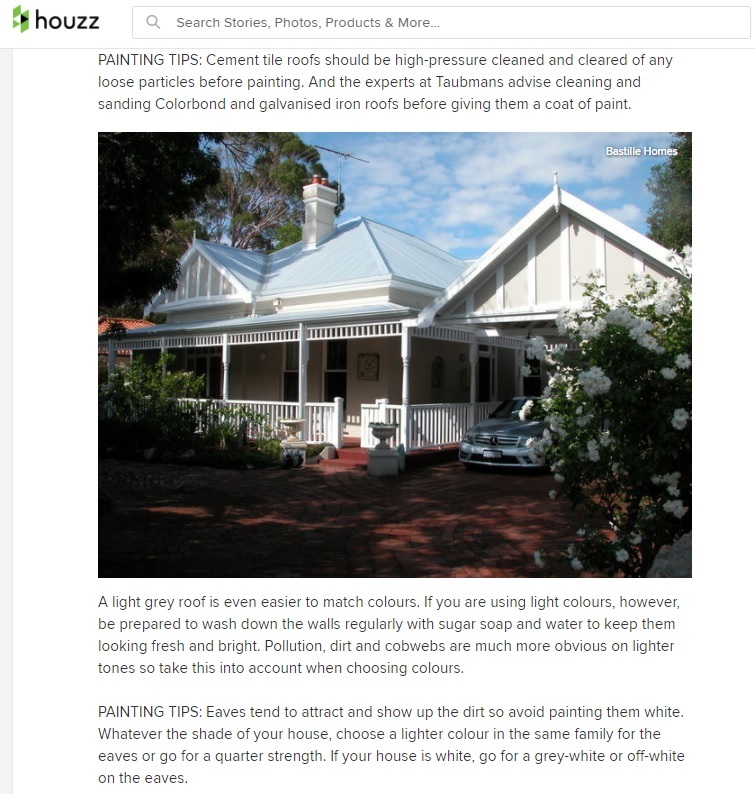 Houzz has some great colour ideas for Federation houses and other older style homes. Do I need to match the roof with the exterior and interior colours? In most cases you will want to create a relaxing sense of flow throughout the house and the roof is a good place to start as that frequently is the first impression people have of your home. Of course, contrast can be great and you will want to express your personality but taking too many uncalculated risks with colour can leave your house sticking out like a sore thumb. 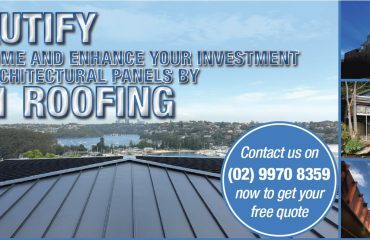 Wattyl have some great inspirational ideas and tools for matching your roof and exterior colour schemes. Interior colours feel more intense because of the presence of four coloured walls so bear that in mind as you plan your transition from outside to inside. 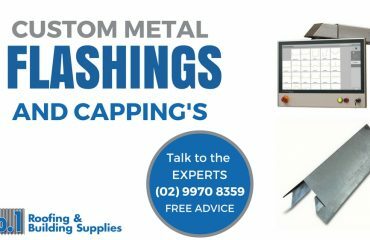 This blog will provide some inspiration for thinking about flow and how it will affect your roof colour choice, whereas this metal roofing article on choosing Colorbond Colours will provide some very practical tips on the physical and practical aspect of how to balance the colours. What other things that might affect my roof colour choice? 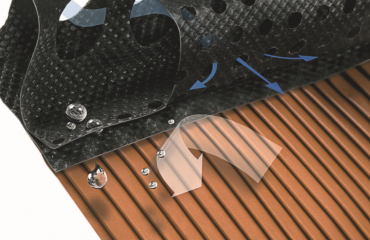 Colours can make a big difference to thermal performance of your roof. A U.S. study suggests that you can save as much as 23% of your summer cooling costs with a lighter coloured roof. This American website has some great information about how you can choose your roof colour for optimal thermal efficiency. Guttering, fascia boards, and eaves can also help you narrow down your colour choices. Schneider suggests that matching non-structural elements of the house such as guttering to your roof colour will help make them less obtrusive. However, you might want to pick a contrasting colour for your eaves. Ask yourself: is this a roof I’m going to be happy to live with for twenty years? Or perhaps you intend to sell the house after the roof has been finished; in this case you are probably better to go with more neutral colours to appeal to more buyers. Sometimes you really just need to see what your colour scheme will look like. Fortunately, there are some great online tools that allow you to visualize your chose scheme and spend time with it. You can see the entire Colorbond range of colours at the Colorbond website along with the inspiration behind the colours. Colorbond also has a great online visualiser for desktop here. You can modify the colours according to your style of house and environment and see how the roof will look along with your chosen guttering, walls and trim colours. There is a good slideshow here that graphically demonstrates some of the ideas covered in this blog. 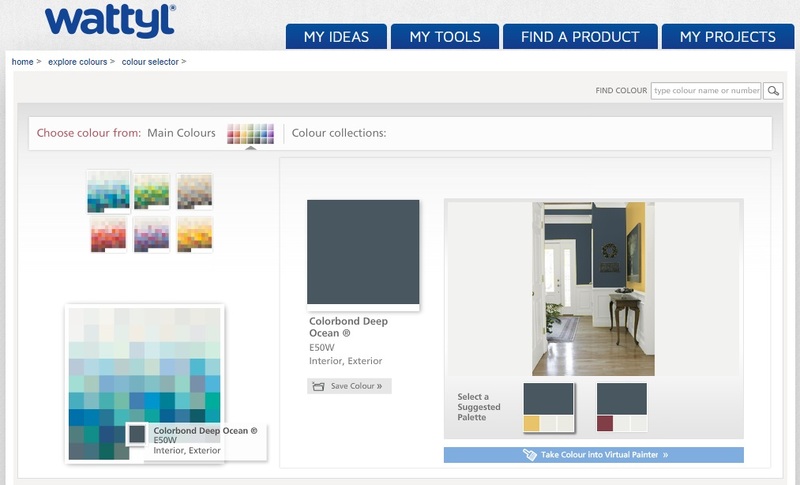 Here's a walk through video on using the Colorbond Online Visualiser. Once you’ve made your selection using the Online Visualiser you can save, print and email the finished images. Here’s an example of the Colour Print out from the Colourbond Visualiser, you can print from your PC or email to a friend. Can I repaint a Colorbond roof? Yes, you can. Wattyl and Resene have some good solid information about repainting Colorbond steel. So, now you can go to town and splash out on the colour scheme that really tickles you pink and don’t forget; No.1 Roofing and Building Supplies –we’re here to help.